Keep your signage looking sharp with Hi-Tech Signs maintenance services. Our Los Angeles repair company has years of experience in every aspect of sign production, and we are prepared to offer our customers timely and efficient services in the event of virtually any form of sign damages, from chipped paint to flickering lights and etc. If your well-loved and widely-recognized sign has worn down over the years, or if you believe your sign's time has passed, call on Hi-Tech Signs today to see your sign restored to its former self, or to make way for a brand new look for your storefront. At: Hi-Tech Signs, we recognize that damaged signs are bad for business, and that the longer your sign is allowed to remain damaged, the worse your business looks in the eyes of customers. This is why our sign repair and maintenance services are available 24 hours a day, so that the minute you notice a problem with your sign, you can call Hi-Tech Signs In L.A. to have it dealt with as promptly as possible. We Know Over the years, even the best-made signs can experience wear and tear. Wiring can go on the fritz, paint can fade, and accidents can happen. 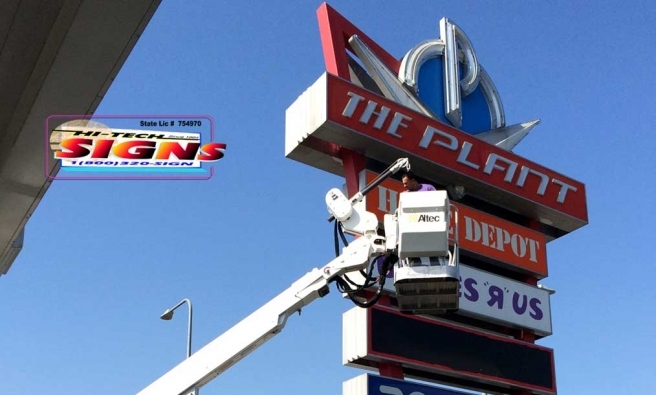 If you are dealing with a weathered, scratched, tilted or otherwise damaged sign, Hi-Tech Signs In L.A. will have it looking its best again in no time.